DURHAM, N.C. — It was unfolding like a horror-movie sequel, and not one that would warrant any critical acclaim. Same villain. Same victims. Barely altered plot, with a setting only 8.8 miles away from the original. Grayson Freakin’ Allen—last seen in the Duke-North Carolina rivalry on Feb. 17, a young man in black, making a joyous sprint across the Dean Dome court after a 74–73 upset in which the Tar Heels were shockingly gutted and stripped of a seven-point lead over the final 11 minutes—was becoming a problem again on Saturday. He had turned a 10-point Carolina lead, with 19:13 left in the second half, into a 49–49 tie with 11:56 left on a pull-up three, and grinned and nodded at a Cameron Indoor Stadium crowd on tilt as Roy Williams called a 30-second timeout to try to stanch the bleeding. The speakers at Cameron began pounding with an infernally repetitive club track called “Turbulence.” The 76-year-old stone building felt as if it were shaking, and the Tar Heels looked as if they might once again fall apart. It would lead to the same inquiries that nagged them after losses to Duke, and at Virginia, Notre Dame and Louisville. And rightfully so, because it would have created a scenario in which the nation’s preseason No. 1 team would be entering the NCAA tournament without a single high-quality road win on its resume, and having made no compelling argument that it had the makeup of a national champion. A scenario in which a veteran team knew, when it walked onto Duke’s home court on Saturday night, that a win would clinch everyone on UNC’s roster’s first ACC regular-season title—and still blew a second-half lead. Williams tried to keep word of Miami’s loss at Virginia Tech, which cleared Carolina’s path to the ACC crown, from leaking into the locker room prior to the game, but as senior guard Marcus Paige put it, his coach “isn’t that slick.” The team caught wind of it on Twitter, so the players were fully aware what was at stake when they left their huddle with 11:56 left in a 49–49 game of the greatest rivalry in college basketball, with all the momentum favoring Allen and the Blue Devils. And what did North Carolina do next? It committed a turnover. Sophomore guard Theo Pinson coughed the ball up to Allen, who was instantly off in transition. But it was here that the plot twist arrived: a twist not just on the game but also on the Tar Heels’ season. Rather than falling apart, they fought back. Pinson freed the ball from Allen’s hands as he attacked the basket, and on the other end, in transition, Pinson tipped in a Justin Jackson miss. On the ensuing Duke possession, Carolina converted an Allen missed three into a transition layup by Paige to take a 53–49 lead. 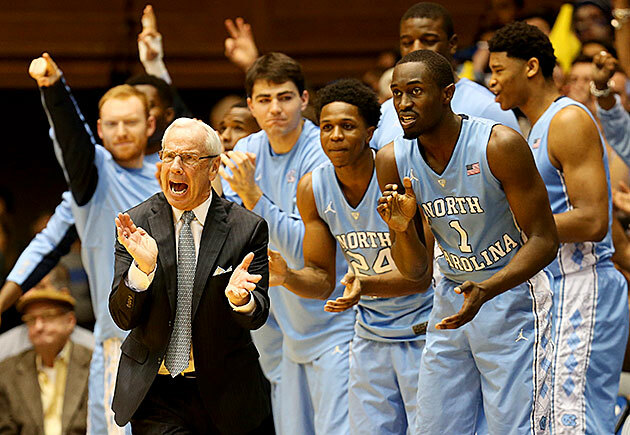 The Tar Heels then clung to small leads, warding off Duke mini-runs, for the rest of the game. UNC left Cameron not as horror-flick victims, but as 76–72 victors, outright ACC champs and players who were no longer 0-fer their careers at Cameron. And they finally have some semblance of a response to the many who see Carolina as lacking the killer instinct to win a title. Paige surveyed his locker room and said, “I don’t see a lack of killer instinct today, is all I’ve gotta say.” The senior two-guard did not have his greatest day—he was 3 for 10 from the field for 11 points, while his primary defensive assignment, Allen, scored 29—but Paige remained defiantly upbeat. What the Tar Heels did on Saturday did not inspire Twitter awe or generate any rewatchable Vines. They shot 37.3% from the field to Duke’s 35.6%, and 17.6% from long-range compared to the Blue Devils’ 38.2%. Carolina had a what-are-you-doing possession that began at 9:23 of the second half, in which it missed five consecutive shots, offensive rebounded the first four then corralled an errant Duke outlet pass, only to miss two more shots and finally give up the ball after more than a minute expired. “There was a lid [on the basket],” Jackson said. "But we outrebounded them something like 64–29, and that’s what kept us in the game. Most of the time you can’t shoot 28% in the second half against a team like that and still win." That rebounding stat Jackson cited was not an exaggeration. Sixty-four to 29 is how this game was decided. Carolina’s offensive-rebounding percentage was an otherworldly 56.2% and Duke’s was a measly 17.8%. • THAMEL: Coaching carousel: Will Rick Pitino be heading to the NBA? Johnson had 12 offensive boards on his own—more than the entire Duke team, which had eight—and Kennedy Meeks added six. Carolina has a long-standing reputation for aesthetically pleasing, uptempo, offensive basketball, but the 2015–16 Tar Heels have accepted their identity as cold-shooting, glass-crashing grinders, and against Duke they scored 20 second-chance points and displayed more grit than the nation had been accustomed to seeing. As Jackson stood fielding questions in front of a locker-room whiteboard that said “1 = Champions,” referring to the number of wins the Heels needed coming into Saturday to clinch the ACC title, some of his teammates began studying the long, fresh cut across the bridge of his nose. It was a genuine battle scar from getting hit by one of Duke freshman Brandon Ingram’s razor elbows in the second half. “I thought you was ugly before, but you ugly now!” Johnson said. Champions by any means necessary, even if it means only scoring six points in transition, or only making four threes or only shooting 28.2% in the second half. The Tar Heels came into the season dreaming of an ACC championship and a national championship, and Williams, who won it all with more complete and dominant UNC teams in 2005 and ’09, believes that this team still has a chance to win his third. “I’ve said all year long that our dreams are realistic,” he reiterated on Saturday. Beating Duke may not have been enough to convince everyone else that these Tar Heels are true contenders. But there’s less skepticism now—and that, at least, is a step in the direction of belief.